...is a journalist who currently serves as lead reporter and principal photographer for TheaterMania.com. He is on the Executive Committee of the Outer Critics Circle. David's breaking news journalism has been seen on AOL-Patch and in The Queens Courier and The Queens Gazette, with theater reviews featured on NYTheatre.com. His work has also appeared in Metro Newspaper and The Hofstra Chronicle, for which he served as arts editor and managing editor as an undergraduate. He has had letters published in Newsday and The New York Times, and theater reviews excerpted in published play texts and other marketing materials. 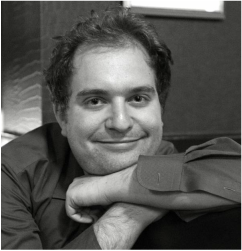 An active theater practitioner, David has directed (Adam Bock's The Receptionist), written (an original play for children called Goldie! ), served as dramaturg (Tony Kushner's Angels in America: Millennium Approaches; Annie; Annie Get Your Gun; Oliver! ; The Marriage of Bette & Boo), and occasionally acted. Born and raised in Queens, David received his Bachelor of Arts with high honors distinction in journalism from Hofstra University and his master's degree in theater history and criticism from Brooklyn College.